Easily my favorite part of Asian take-out before going gluten free, spring rolls (fresh or fried) are utterly addictive and super simple! The key? Those translucent rice wrappers! 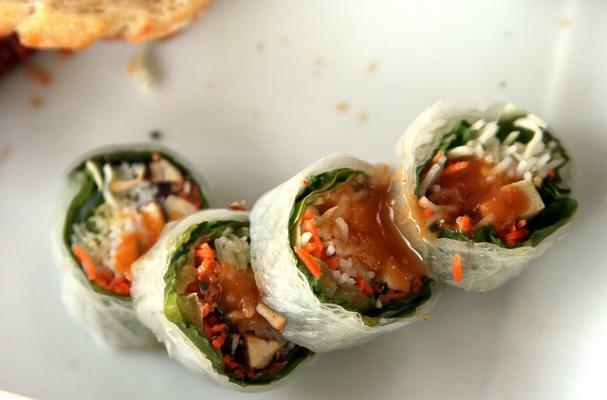 Found in Asian grocery stores, online and at Whole Foods, Vietnames spring roll wrappers are brittle, rice paper disks that become pliable once soaked in water. In the battle of fresh vs. fried, there is no comparison! Fresh spring rolls are soft and refreshing; fried spring rolls (like egg rolls) are crispy-crunchy comfort-food-alicious! Here are a few recipes for naturally gluten free/dairy free springs rolls that you can prepare either way, fresh or fried, with delicious results all around! * Note: Please check all ingredients in pre-made sauces and products! Also, be sure to use gluten free options (like Tamari) where recipes call for soy sauce! The crucual instructions on how to take your spring roll to the next level! Simple, traditional and super tasty. With marinated chicken for a tasty seafood-free treat. With asparagus and scapes - yum! Fried and fabulous with a crispy-crunchy wrapper. A classic sandwich reincarnated, oriental style.